At the young age of thirty, Lawrence Njunge has already lived a lifetime of experiences. Despite the many events that caused him to take a step backward, his tenacity for a purpose driven life continues to pave his way forward. Lawrence currently runs East African College of Technology in Ruai, a densely populated town approximately thirty kilometers from Nairobi. Although he began this school a short three years ago, the birth of his dream started long before. Being the first born of his family, Lawrence began taking care of his siblings when he was in first grade. While his mother traveled to buy and sell mitumba (used clothes), Lawrence watched over his younger brothers and sisters. He smiles as he reminisces about being teased by the community because he was often seen carrying them on his back. With a family of eleven children, expenses ran high and cost for education was difficult to come by. It is because of this constant struggle that Lawrence decided to build a career dedicated to education. Due to the lack in starting capital, he began his venture by opening a daycare. When Lawrence accrued enough savings he started his first school, but due to unjust treatment by authorities, Lawrence moved to Mombasa where he bought a motorbike and earned a living as a boda boda driver. When he moved back to Nairobi, he unfortunately lost everything due to the post-election violence. Finding employment at Kenya Medical Training College, he was transferred back to the coast. At this time he decided to try his hand once more at opening his school. Unfortunately, his employer wanted to relocate him and East African College of Technology was put on hold again. Lawrence quit his job and in order to earn a living, he started training as a marathon runner. While he was successful, his days as a runner were short-lived when he injured his leg in a motorbike accident. Lawrence then went back to teaching. Seeing and experiencing challenges within the workplace, he took this as a perfect opportunity to revive EACT. Three years in the making, Lawrence is now tirelessly working to prove the quality of his school to the community and students countrywide. EACT is currently undergoing renovations, as Lawrence recently moved the school to a bigger building. 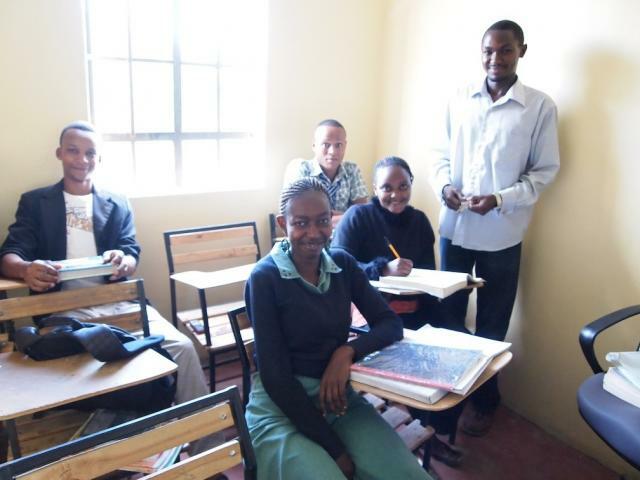 Wanting to make his classrooms a nurturing environment for his students, Lawrence used his Zidisha loan to pay for comfortable rolling chairs. With the help of his loan and his other family business (a general shop), he was also able to purchase more tables and computer monitors. Being a first-time Zidisha borrower, Lawrence would like to see his future loans going towards opening a cyber café run by his students, providing employment for them while and after they graduate from EACT. In addition to running the school, Lawrence also provides affordable housing for his students. His students graciously show me their current hostel and are happily awaiting the day they can move into their new dorm, conveniently situated in the same building as the school. Lawrence would also like to concentrate more of his efforts on marketing in various towns in Kenya and East Africa. If he is able to employ more teachers (there is only one more teacher) this will allow him to do just that. My visit with Lawrence was filled with many more stories, so much that my pen could not keep up with his accounts. And with every memory shared, it became clear that this is a man that stares adversity in the face, smiles, and walks on by, only growing stronger in the process. Thank you Lawrence for a wonderful day. Please greet your students for me and thank them for the nice tour. I look forward to seeing the growth of EACT and wish you the best in all your future plans! To view more pictures of my visit with Lawrence, his classrooms, and students, please visit http://www.talkingstorykenya.wordpress.com. “Thanks all lenders because this loan has done marvellous on our instituion’s development, we have relocated to a new building, integrated the hostel in the same building, advertised and created four more job vacancies; two tutors, marketer and a security officer. The East African College of Technology has indeed transformed to a greater height, why didn’t someone tell me this earlier before? i suffered from ulcers trying anything I could to have a successful reshaping but to no avail. When Tracy came we had only managed to shift into one self-contained but without further ado, students started flocking and now we need more computers, more beds, more lecture seats, more space and wow! more marketing. The list is endless. Borrowers please! be good manager of these funds and believe it or not! You will make merry! Now am proud, not because of myself but God and Zidisha for Zidisharing my Business and making its name recognised by the endless developments. Posted on June 2, 2013 by Julia Kurnia. This entry was posted in Uncategorized and tagged kenya, microfinance, p2p lending. Bookmark the permalink.